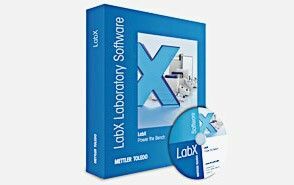 No matter where you are use LabX Mail to receive a tailored message with the latest results, when a sample changer is ready to test new samples or when results are out of specification. Each instrument connected to LabX has its own workbench correlating to that instrument. 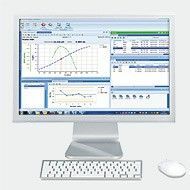 It offers all the components needed to run your daily tasks and the tools to monitor your sample series and results. 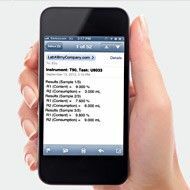 Use the statistics view for quick and easy inspection of results to see if they are in established limits. All the methods and series are stored in one database. Thus the methods and sample series that you create in LabX or at the instrument are always available wherever you are. 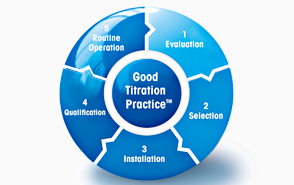 Beyond that the titrator and workbench intelligently display solely those methods and sample series that can be run by the selected titrator model. 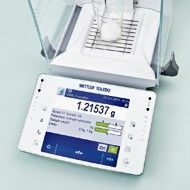 One Click® is a well-recognized concept of METTLER TOLEDO instruments. LabX offers you the same concept and helps to easily distribute shortcuts for different users over various instruments. To facilitate your workflow, LabX offers the task scheduler and SmartCodes™ to automate your analyses. 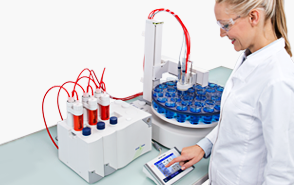 Use SmartSample™ for secure and efficient titration weighing. Remove transcription and ordering errors as well as improve efficiency with the new SmartSample™ RFID technology workflow. Identify and weigh your titration samples at an Excellence Analytical Balance with the SmartSample kit. Enter the sample identification (ID) at the balance to make sure the ID and weight are properly assigned to the physical sample. Set up your SmartCodes and fully automate the selection of the correct method and transcription of samples IDs with a barcode or SmartSample™ RFID tag. Thus, eliminate sample order errors by reading the sample information as you test it. As well as ensure the right method is selected for each product. Use the automated 1D and 2D barcode reader with InMotion™ Autosamplers. Use the Scheduler to automatically start tasks, e.g. begin Karl Fischer pretitrations right before coming into the lab for the day. Or schedule LabX to do the weekly sensor calibration for you. Periodically take samples of production line baths to observe the correct ion concentrations. • Сommunicate to all lab systems. 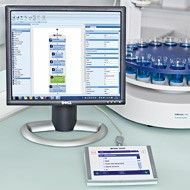 For software validation in accordance with regulatory bodies such as FDA, METTLER TOLEDO offers on site validation support with the Validation Manuals I and II. Validation Manual I offers the necessary documentations for vendor qualification and Validation Manual II for the validation of the software including installation and operational qualification (IQ & OQ). The Regulation option of LabX server provides all the necessary tools to meet the FDA regulation (21 CFR Part 11) for data management and storage. All relevant actions taken at the instrument or PC are recorded in the audit trail of LabX for full traceability and flexibility, no matter where you work. Define users (Individual users) and roles (Lab Technician, Lab Manager, Quality Control, Administrator, etc.) in the LabX software. Access to functionality is based on the defined rights each user or role is given. Login to all your instruments and PCs on your LabX network with the same username and password or fingerprint via the LogStraight™ fingerprint reader. This option includes audit trail and e-signatures (releasing and signing) of methods (SOPs), reports, results, etc. electronic signature is possible via username and password or via LogStraight fingerprint reader. With the regulation option combined with the user management option, your system will be audit ready at any time.